#BrumHour saw Kunene and the King at the invite of the RSC. 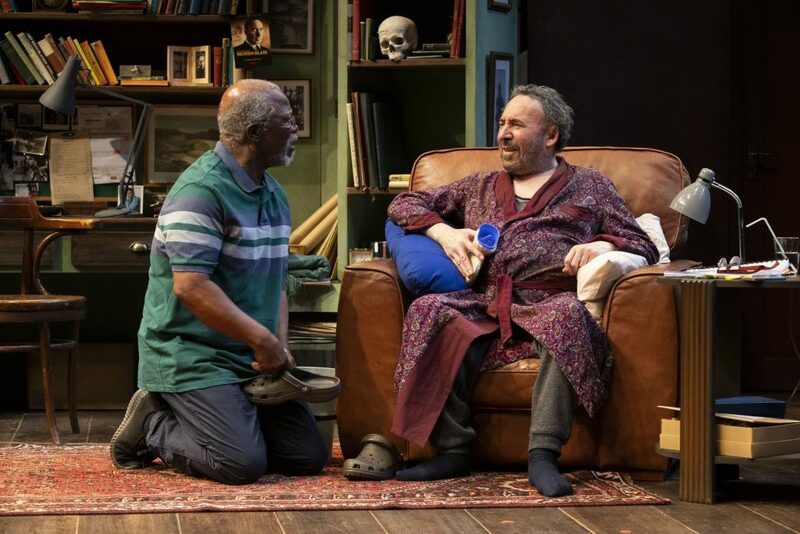 Kunene and The King is at The RSC’s Swan Theatre in Stratford-upon-Avon until 23rd April. 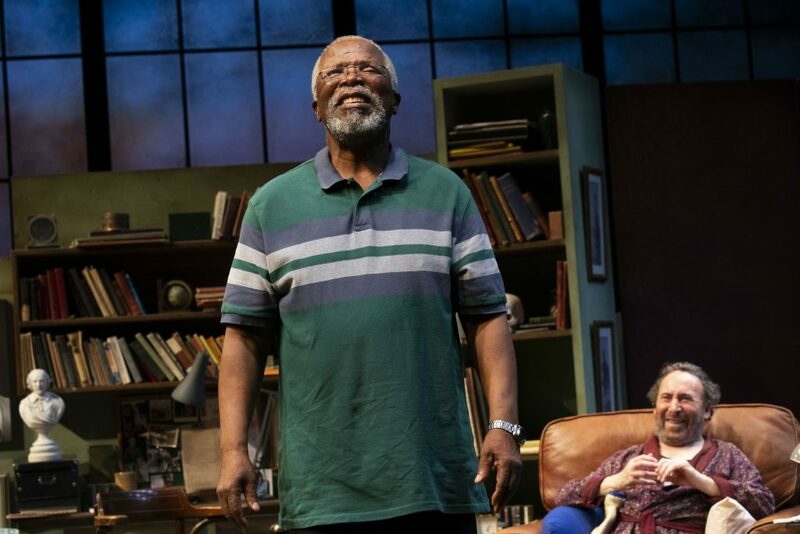 John Kani is a remarkable man: having spent thirty years fighting Apartheid, interrogated by the State while playing South Africa’s first black Othello and losing an eye to police brutality, Kani sees the revolutionary power of theatre. In Kunene and the King he interrogates racial tensions in South Africa twenty-five years after the end of apartheid to examine its legacy and interrogate the universal power of art. Kani plays Lunga Kunene, a partially-retired black nurse living in Soweto, assigned to care for the white Shakespearean actor Jack Morris (played by Antony Sher) as he is afflicted with stage four liver cancer. Jack has grappled with the mortality of Shakespeare’s characters on stage for decades, but suddenly faced with his own diagnosis he is forced into denial. He spins a new story that he can recover from his terminal illness so he can play the role of a lifetime: King Lear. 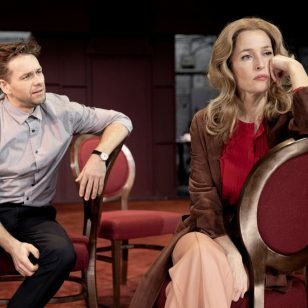 The two are reluctantly forced together and soon connect through Shakespeare as Jack prepares for the role of the king. Not only is Jack complicit in the stereotyping of Lunga as an “angry black man”, Jack resents the fight for racial equality because he believes black South Africans gaining equality means he as a white man loses ground. Like the character of Caesar he played, he used to stride like a colossus as a white man under apartheid in South Africa, and he cannot bear change as he is forced to face his own mortality. He is haunted by his deterioration, the face of his younger self as Hamlet, a constant over his shoulder as he sits wracked by pain and disease. A Shakespearean actors ideal life progresses from Hamlet to Lear, but he is steeped in Lear’s instability, living out the role of his life. Jack’s love of acting is not limited to the stage, he constantly seems to be performing and hiding himself in other characters. 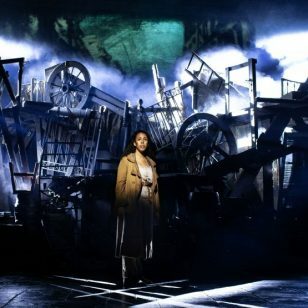 When he chokes up with emotion as he is forced to face his own mortality, he stands centre stage and stares into the audience and performs his grief to them, hiding his own face from Lunga. His love of Shakespeare has consumed his life to the point that his life merges with Lear’s, his final movements on stage seem clearly to be those of an actor performing his own life instead of living it. This love of theatre is contagious, and Lunga gravitates towards performing, even stopping Jack to take over their reciting of Antony’s famous speech in Julius Caesar. This is where the two men connect: Shakespeare. 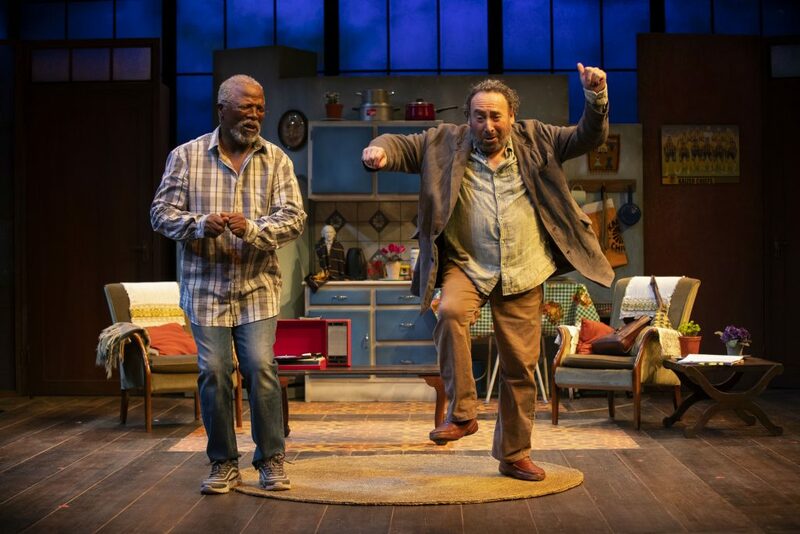 While Sher plays the veteran Shakespeare actor and Kani the novice, their diverging lives are a difference of privilege, evident in the revolving stage showing the contrast between Jack’s cosy bohemian home and Lunga’s more austere house in Soweto. There was no investment in Shakespeare in black South African schools, and the only play allowed to be taught was Julius Caesar through the lens of propaganda, with the conspirators representing terrorists. While Jack reignites Lunga’s childhood love of Shakespeare in the form of Julius Caesar, Lunga seems to understand Shakespeare even better than Jack, asking questions that cut to the heart of the plays, considering the characters’ actions and motivations which Jack has simply taken for granted. Through Lunga questioning the decisions Lear, written by a white man, takes, Kani’s play questions the universality of Shakespeare. Shakespeare’s characters are said to be intrinsically recognizable to everyone, but take the thoughts and actions of a white man as a blueprint for all of humanity. And yet conversely, the impact of Shakespeare on these two men from different walks of life shows the capacity of Shakespeare’s work to resonate with everyone, transcending even the English language as Lunga recites Julius Caesar in the Xhosa language which he finds more emotive. Janice Honeyman skillfully directs the play so that the racial tensions simmer until they explode, stirred by Jack Morris’ disdain for black people. Kani exposes the terrifying realization that Jack does not care about the fight for racial equality because his own life is ‘over’, exposing the horror of the world that those who benefit from systematic oppression do not care deeply about making change happen. Sher is excellent at balancing the venom of a bilious, prejudiced racist (the audience audibly hissed at one of his outbursts) with the grief of a man facing terminal illness. However, the most moving moments of the play come from Kani as the layers are stripped back to reveal the mottled scars of his own emotional torment from years of living under apartheid and its legacy. This is a deeply moving two-hander that shows how difficult it is to instill progress unless people learn to accept change.